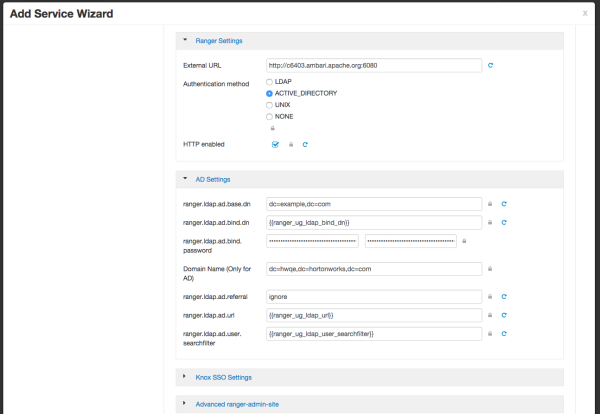 How to configure Ranger to use AD for user authentication. Enter the external URL, e.g. http://my-vm.hortonworks.com:6080. Under Authentication method, select ACTIVE_DIRECTORY. Under HTTP enabled, make a selection. 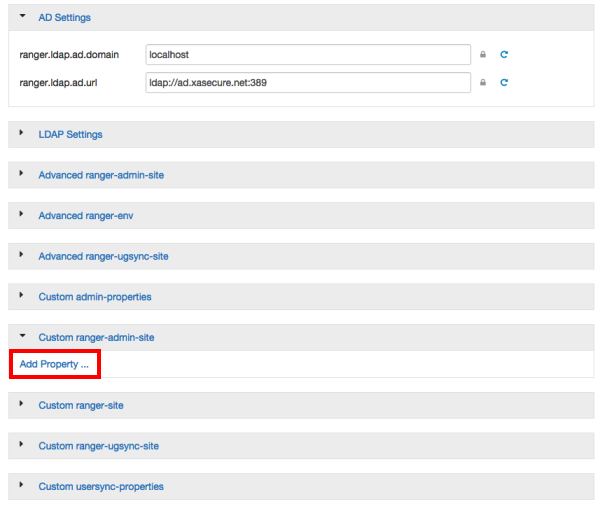 This option enables you to select HTTP/HTTPS communication for Ranger admin console. If you disable HTTP, only HTTPS is allowed. HTTP is enabled by default. ranger.ldap.ad.bind.password Password for the bind.dn. This is a macro variable value that is derived from the Bind User Password value from Ranger User Info > Common Configs. Select Custom ranger-admin-site, then click Add Property. There are three possible values for ranger.ldap.ad.referral: follow, throw, and ignore. The recommended setting is follow. When searching a directory, the server might return several search results, along with a few continuation references that show where to obtain further results. These results and references might be interleaved at the protocol level. When this property is set to follow, the AD service provider processes all of the normal entries first, and then follows the continuation references. When this property is set to throw, all of the normal entries are returned in the enumeration first, before theReferralException is thrown. By contrast, a "referral" error response is processed immediately when this property is set to follow or throw. When this property is set to ignore, it indicates that the server should return referral entries as ordinary entries (or plain text). This might return partial results for the search. In the case of AD, a PartialResultException is returned when referrals are encountered while search results are processed.